The unexpected discovery of oxygen around a distant comet has shocked secular astronomers and challenges the current evolutionary models for the universe’s origins. In 2004, the European Space Agency (ESA) launched the “Rosetta” spacecraft to rendezvous with a comet. “Rosetta” arrived at Comet 67P last year and has since been orbiting the comet and relaying observations back to Earth. “ESA’s Rosetta spacecraft has made the first in situ detection of oxygen molecules outgassing from a comet, a surprising observation that suggests they were incorporated into the comet during its formation,” the statement announced. Where did the oxygen come from? According to the evolutionary models, it shouldn’t even be there. “We weren’t really expecting to detect O2 at the comet—and in such high abundance—because it is so chemically reactive, so it was quite a surprise,” Kathrin Altwegg, who helped analyze the spacecraft’s findings, said in the ESA release. 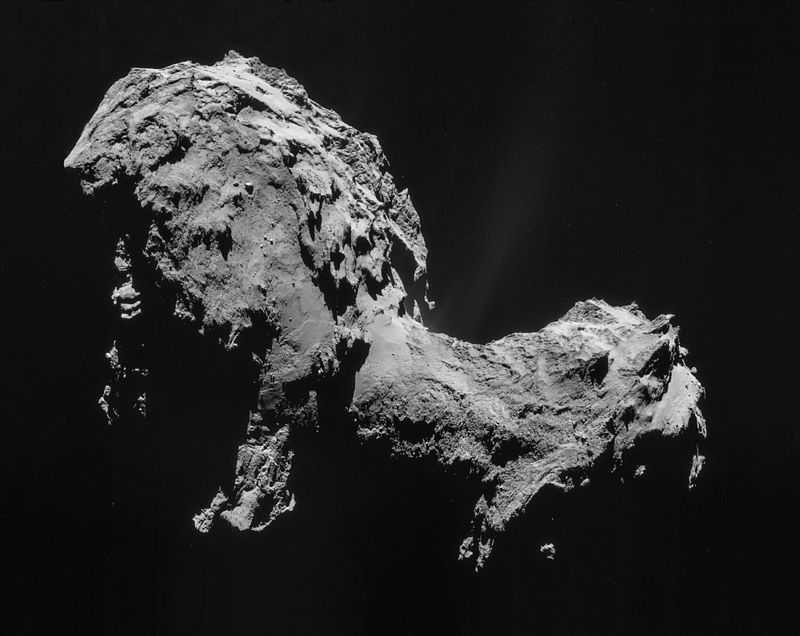 Secular astronomers believe that Comet 67P is several billion years old. However, according to the secular model of the solar system’s formation, the oxygen should have paired off with hydrogen long ago. Brian Thomas, science writer for the Institute for Creation Research, said the existence of the abundant oxygen around Comet 67P is entirely inexplicable in the secular models. The Genesis creation account provides a more plausible explanation for ESA’s recent discovery, says Thomas. Where the secular model falls short, the biblical model makes sense, Thomas proposed. The very existence of comets today is problematic for secular astronomers. Comets, which are often described as “dirty snowballs,” lose copious amounts of gas and dust every time they orbit the Sun, so they cannot survive for millions of years. Some scientists suppose that comets originate in a distant “Oort Cloud,” but such a cloud has never been observed. The biblical model, in contrast, “has the advantage of explaining the presence of comets in our solar system without invoking an ‘Oort Cloud’ for which there is no evidence,” Thomas opined. “Creation appeals to a Creator for which there is unmistakable evidence,” Thomas said.